Simba and Mufasa from Disney's The Lion King are one of Disney's most heartwarming portrayals of a father-son relationship. This roughhousing scene from artist Jim Shore captures their love in beautiful handcrafted detail, sculpted from stone resin and hand painted in vivid color. 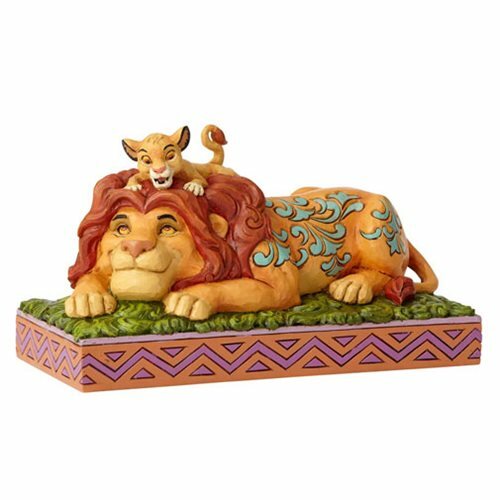 Measuring 7 7/10-inches wide x 4 2/5-inches tall, the Disney Traditions The Lion King Simba and Mufasa A Father's Pride Statue by Jim Shore makes a great gift for Father's Day or as a keepsake for a new dad.